The school library is the first place where a child is formally introduced to the world of books and reading. Being a school librarian has been challenging yet a fruitful and enriching journey for me. To be a good school librarian demands a love for books and reading, dedication, hard work, patience, passion, continuous learning, effective management and technological training too! Gone are the days when school libraries had an isolated identity and school librarians were just called storekeepers. Now, school librarians are active participants in the curriculum. Traditional school libraries were only concerned with the job of acquisition, cataloguing, classification and the circulation of books. 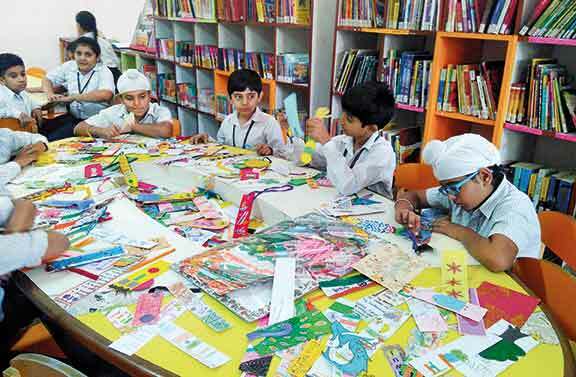 But in today’s scenario, school librarians are engaging their students in reading projects, organizing book fairs, author visits, workshops and competitions to inculcate reading habits in them. In order to bring awareness and inform the students, staff and parents about their services and events, school librarians have even started promoting and advertising their resources and programmes. I strongly believe that one needs to come out of a stagnant zone to bring about a revolution. When I took up this profession, I faced a lot of criticism: ‘this profession is very low profile’; ‘you must be just doing a sitting job’ or ‘you would only be taking substitution lessons’, ‘why don’t you try looking for another job’, and people commented on the salary as well. All this made me upset. Amazingly, my first days were so delightful that I decided to take this profession seriously and that’s how I started enjoying my job. The school library room was not ready at that time so I organized the books in a classroom with just a rack for keeping books. When I started interacting with the students in the library, I realized that today’s generation of students is quite keen to read books. They seemed to be quite happy to meet their first school librarian. Soon, I got a beautiful library room with well-furnished wooden racks, reading tables and chairs. How lovely it is to be surrounded by colourful books! I would like to tell the world how fortunate I am to be a school librarian as I am an inhabitant of the land of fairies, magic, thrills, adventure and knowledge. Library orientation: Every year students are introduced to the school library resources, services, instructed on how to use the library’s computerized catalogue – to make it easier for the students to browse books – and also about the circulation procedure and rules. The school library has built a Library Management software to automate library materials and services. Celebration of World Book and Copyright Day: The school recognizes the importance of reading, therefore the ‘World Book and Copyright Day’ is celebrated every year in the school premises. Besides this the students are also taken out for various competitions held in the tricity of Chandigarh, Mohali, and Panchkula. The librarian ensures that every student takes part in the library events. So various activities are designed according to the classes. For example – Newspaper designing, book cover designing, biographical sketch of authors on bulletin boards, designing comic strips, making bookmarks, picture dictionaries and more. Celebration of authors’ birthdays: Various events are organised to celebrate the birthday of children’s authors. By doing this, the students get to know about the author, his/her writing style and they are also motivated to read more. We celebrate the birthdays of Enid Blyton, Ruskin Bond, Roald Dahl, Tagore, J.K Rowling and more. The events could include short quizzes, making greeting cards, introducing authors to the students through a beautiful display, fancy dress competition comprising the characters created by the authors, creative writing and more. The National Library Week: The school celebrates the ‘National Library Week’ to mark the importance of a school library and reading. Various events are organised for week long celebrations: grandparent’s storytelling, book jacket designing, book talks, special assemblies and more. Book Fairs: The school organizes book fairs in the school premises and the students are also taken out to visit book fairs around the city. Book fairs certainly help the students take up the habit of reading. Such fairs are organized mostly before the summer and winter vacations so as to allow students to pick up the book of their choice for reading during their holidays. Authors’ visits and workshops for the students as well as the staff: Children’s authors and illustrators are invited to take sessions and workshops for the students to arouse their interest in reading and also further motivate the students to develop their writing skills. Book Reviews: Students are asked to write reviews of the books they have read. This helps in developing the reading as well as writing skills. It could be done in any of the following ways – describing the character, favourite character, twist in the book and plot of the book. The idea is to let students share what they have read. Summer reading challenge/Reading instruction program: I started this project in my initial years of this job. I always wanted students to understand the content of the books and take pleasure in reading. To achieve this goal, I played the dual role of a librarian as well as a reading instructor attending to each child’s reading queries and also helping children in improving their reading. In the library, a writing board was put up to practice reading with the junior wing. Every year the students participate in the ‘Summer reading challenge’ to win special awards. More than a competition, this project enables us to evaluate the reading level of every child and helps us to identify weak students who need extra attention and assistance. This project has proved successful as I could see many good readers coming up from that level. Inter-house library quizzes: The school library conducts an inter-house library quiz for all classes. This is an annual event and students look forward to participating in these quizzes. The library quiz syllabus is uploaded on the SchoolPad which is an online portal for teacher-parent interaction as well as the school library blog at the beginning of the session. Each class has to read the books in the library quiz syllabus. All students participate in the preliminary round before the finalists are selected. On the final day, the quizzes are conducted by the librarian via audio-visual tools and activities. All houses compete with each other to win positions. These quizzes are surely a hit in our school and create a lot of excitement among the students. Library trophy: The concept of a ‘Library trophy’ might be new for all of us but in our school, it started a few years ago. The trophy was introduced to achieve the goal of having a readers’ community. Designed as an open book, the trophy is awarded to the best performing house at the end of each session, and its owners change every year. No wonder the spirit of competition brings good results and that’s the magic of this effort taken to build a reading school. Library-board Best Readers’ Award: Besides the best house trophy, individual best readers awards are given at the ‘Annual School Investiture Ceremony’. The best readers are felicitated with the best reader trophy and a certificate. These are judged on the basis of a criterion that is also uploaded on the school communication tools (SchoolPad and Library Blog). School library blog: In today’s world, the social media has become an integral part of our lives. Many school libraries use traditional media: newspapers, newsletters, brochures and yearbooks to showcase what they have and what they do. But, how about a ‘blog’ as a promotional tool? In fact, all school librarians around the world should step into the world of ‘blogging’ to tell their library’s stories. I felt the need of having a school library blog to promote our library services, resources and events. It keeps the reading community well informed about all the happenings of the library. In short, it has everything to do with our school library and has served the purpose of putting our school library on the web and has made it accessible to all. Our blog is duly recognized by the school management and the link is available on our school’s website. October is celebrated as International School Library Month. It’s a festival of books and authors and is celebrated all over the world to mark the importance of school libraries. This event is conducted by the ‘International Association of School Librarianship (IASL).’ Our school has been participating in ISLM Projects from the last four years and it has given me greater insights about the libraries around the world. How exciting it is to find new friends around the world via the medium of books and bookmarks! That’s what we do by participating in ‘International Bookmark Exchange Project’. It’s a fun way of sharing information and facts about our country with our partner schools around the world. We celebrate ISLM every year and the students enjoy making bookmarks and sharing it with our partner schools from Singapore, Canada, Croatia, USA, Hong Kong, Portugal, Romania and Hungary. Technology has certainly brought the world closer. We also participate in the project ‘Skype around the World.’ Our students have interacted with schools from Croatia, Hong Kong, Indonesia, United Kingdom, Russia and Romania. This project has certainly given a wider exposure to school librarians as well the student community. School librarians all over the world can work on various collaborative projects. For example, our school students exchanged the book reports with a school in Spain and Indonesia. Project ISLM has gained popularity and recognition in the Indian school library system proving that school libraries are a strong platform for making book friends across the world. Nobody need find this profession dull as there’s a lot that librarians can do. One just needs to think out of the box and implement new trends for encouraging the school community to read and develop a love for reading. Seema Sohal. The author is a librarian at Learning Paths School, Mohali, Punjab (India). She can be reached at library@learningpaths.in. http://lpslibrary.wixsite.com/knowyourlibrary.